Robbing a bank is never a good idea. We shouldn’t have to tell you that. But a teenager from Austin really stretched the boundaries of what defines a bad idea. 19-year-old Luca Mangiarano decided to rob a BBVA Compass bank in downtown Austin on Thursday, Texas local newspaper Austin American-Statesman reports. His getaway vehicle of choice: a Jump electric scooter. Mangiarano wasn’t exactly a professional when it came to robbing the bank. He disguised himself in a hoodie, walked up to the teller, and handed her a note demanding some cash, according to the Statesman. She didn’t think much of it, and handed him the cash. A different employee watched as the teen tried to grab a scooter and fly off into the night. 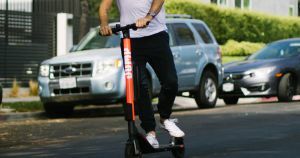 The police had the bright idea of subpoenaing the data connected to the specific Jump scooter from parent company Uber. Through video footage, they were able to figure out which scooter Mangianaro used to get away. From there, Austin police connected the (very few) dots. They even managed to get Mangiarano’s phone number, email address and credit card number, the Statesman reports. Further condemning the 19-year-old was cellphone tower information that proved he was at the scene of the crime. Better luck next time. A Jump bike might have been a better idea.